After a decade’s worth of best-selling action adventure games from Japan, Devil May Cry's protagonist Dante has headed West with a new master, the UK developer Ninja Theory. 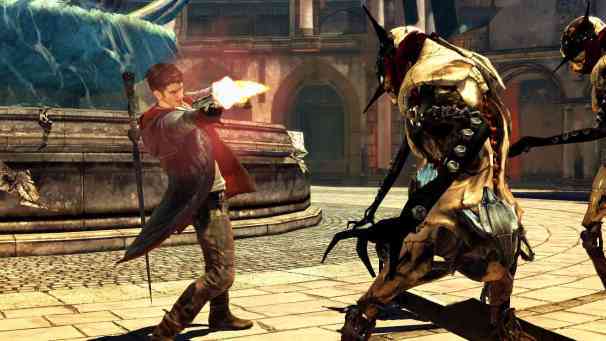 The new team hopes to breathe fresh life into the Devil May Cry franchise, which now goes by DmC. The reboot chronicles demon hunter Dante’s early years, set against a contemporary backdrop. Alex Jones, producer for DmC at Capcom, talks about what’s in store in this new take on the classic third-person perspective action series in this exclusive interview. Game On: What were your goals heading into this DmC reboot? Alex Jones: Primarily it was to broaden the appeal of the franchise, but also to make sure that we maintained the DNA of the previous series like the mechanics and the fluidity of combat. We retained the Ebony and Ivory and the Rebellion sword to make it a familiar experience for people who have loved previous DMCs, but then by deepening the gameplay in certain ways we’re opening up the accessibility of the game through the input system. How is this game’s Dante a little different from previous incarnations? Because we made a world that’s a little more somber-toned and a little more adult-themed, having his normal sense of humor from the previous games didn’t seem to be a good fit. He still is edgy and wise-cracking and irreverent, but the humor is cast in a way that fits better with the world. It’s a little more gallows, sardonic humor as opposed to one-liners. What do you feel that the new developer adds to this franchise? When we picked Ninja Theory, one of the things we wanted to do is make sure we were working with guys who at least had a foundational understanding of making descent controllable melee combat games. What really sold them was their cinematic presentation and their ability to tell stories and do narrative. Their technology supports their storytelling, which was the mega value add from the studio. What’s the story people will encounter when they enter this game world? It’s a retelling of Dante’s origin story, so you’re going to gsee him as a young man before he’s fully in charge of his powers the way you may have seen in some of the previous DMCs. It’s a reimagining or rebirth of his beginning. What’s going on in the two worlds that Dante inhabits? There’s the real world and there is Limbo, which is a dystrophic mirror image of the real world where the demons can pull Dante in. That’s where they can actually get at him directly, as opposed to indirectly, which is how they operate in the human real world. How deep is the combat in DmC? The thing that you can do that we really think is going to add the next level to combat is you can seamlessly switch between weapons. We used to use royal guard and trickster and gunslinger styles and we’ve streamlined that so now you can really just go from a demon-lined weapon like the ax straight into using a seethe, which is an angel-based weapon. By manipulating Dante’s alignment, angel or demon, you can eventually create an infinite series of combos. What’s a cool combo that you can pull off new in this game? One thing you can do is walk up to a guy and use the uppercut and throw him into the air with a classic DMC move. And then you can use your angel power to lift up that guy, see another guy down on the ground, pull him up. Now these two ground-based enemies are airborne, so they’re helpless and Dante can pull angel or demon moves with these guys and slash at them. The air element of combat adds another level of deck to combat. It’s like 360 degrees of mayhem. What are some of the different enemies that Dante will go up against? What we have now are the stingers with these little demonic cherub guys and they fly around in the air and they can cherry pick at Dante from behind. We have large-scale enemies like the shield drone, which have these huge shields. These give you a chance to explore the depth of the combat because what we want to encourage you to follow the golden path. There are certain combos and weapons that work better on each enemy and we’re not necessarily going to tell you what all those are. We want you to play the game and experiment with what works best for what particular enemy, but what we tried to do is create composites of enemies that will allow you to get the fullest range of your combat. We also want to incentivize you to play in the air.